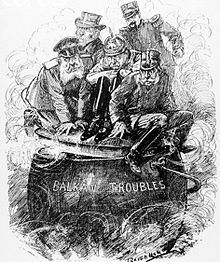 Picture - The rulers of Gemany, France, Russia, Austria-Hungary, and the United Kingdom attempting to keep the lid on the simmering cauldron of imperialist and nationalist tensions in the Balkans to prevent a general European war. They were successful in 1912 and 1913 but did not succeed in 1914. The causes of World War I, which began in central Europe in July 1914, included many intertwined factors, such as the conflicts and hostility of the four decades leading up to the war. Militarism, alliances, imperialism, and nationalism played major roles in the conflict as well. However, the immediate origins of the war lay in the decisions taken by statesmen and generals during the July Crisis of 1914, casus belli for which was the assassination of Archduke Franz Ferdinand of Austria and his wife by Gavrilo Princip, an irredentist Serb. The crisis came after a long and difficult series of diplomatic clashes between the Great Powers (Italy, France, Germany, Great Britain, Austria-Hungarian Empire and Russia) over European and colonial issues in the decade before 1914 that had left tensions high. In turn these diplomatic clashes can be traced to changes in the balance of power in Europe since 1867. The more immediate cause for the war was tensions over territory in the Balkans. Austria-Hungary competed with Serbia and Russia for territory and influence in the region and they pulled the rest of the Great Powers into the conflict through their various alliances and treaties. The topic of the causes of World War I is one of the most studied in all of world history. Scholars have differed significantly in their interpretations of the event. Picture - France began general mobilization against Germany on 1 August. Three days later, Germany declared war on France. Here, on 2 August, Parisians cheer French lancers off to fight the Germans. From the time of the Balkan Wars, which had increased the size of Serbia, it had been the opinion of leading Austrian officials (most notably the Foreign Minister, Count Leopold von Berchtold) that Austria would have to wage a "preventive war" to greatly weaken or destroy Serbia as a state in order to maintain the dual monarchy which held extensive Serb-populated Balkan territories. Between January 1913 and January 1914, Chief of the General Staff Count Franz Conrad von Hx�tzendorf advocated a preventive war against Serbia twenty-four times. Serbia expanded its territory at the expense of the Ottoman Empire and Bulgaria under the terms of the Treaty of Bucharest. Regarding the expansion of Serbia as an unacceptable increase in the power of an unfriendly state and in order to weaken Serbia, the Austrian government threatened war in the autumn of 1912 if Serbs were to acquire a port from the Turks. Austria appealed for German support, only to be rebuffed at first. In November 1912 Russia, humiliated by its inability to support Serbia during the Bosnian crisis of 1908 or the First Balkan War, announced a major reconstruction of its military. Picture - Declaration of a state of war from the German Empire in 1914. On November 28, in partial reaction to the Russian move, German Foreign Secretary Gottlieb von Jagow told the Reichstag, the German parliament, that “If Austria is forced, for whatever reason, to fight for its position as a Great Power, then we must stand by her”. As a result, British Foreign Secretary Sir Edward Grey responded by warning Prince Karl Lichnowsky, the German Ambassador in London, that if Germany offered Austria a “blank cheque” for war in the Balkans, then “the consequences of such a policy would be incalculable”. To reinforce this point, R. B. Haldane, the Germanophile Lord Chancellor, met with Prince Lichnowsky to offer an explicit warning that if Germany were to upset the balance of power in Europe by trying to destroy either France or Russia as powers, Britain would have no other choice but to fight the Reich. With the recently announced Russian military reconstruction and certain British communications, the possibility of war was a prime topic at the German Imperial War Council of 8 December 1912 in Berlin, an informal meeting of some of Germany's top military leadership called on short notice by the Kaiser. Attending the conference were Wilhelm II, Admiral Alfred von Tirpitz - the Naval State Secretary, Admiral Georg Alexander von Mx�ller, the Chief of the German Imperial Naval Cabinet (Marinekabinett), General von Moltke - the Army’s Chief of Staff, Admiral August von Heeringen - the Chief of the Naval General Staff and (probably) General Moriz von Lyncker, the Chief of the German Imperial Military Cabinet. The presence of the leaders of both the German Army and Navy at this War Council attests to its importance. However, Chancellor Theobald von Bethmann-Hollweg and General Josias von Heeringen, the Prussian Minister of War, were not invited. Wilhelm II called British balance of power principles “idiocy,” but agreed that Haldane’s statement was a “desirable clarification” of British policy. His opinion was that Austria should attack Serbia that December, and if “Russia supports the Serbs, which she evidently does…then war would be unavoidable for us, too,” and that would be better than going to war after Russia completed the massive modernization and expansion of their army that they had just begun. Moltke agreed. In his professional military opinion “a war is unavoidable and the sooner the better”. Moltke “wanted to launch an immediate attack”. Historians more sympathetic to the government of Wilhelm II often reject the importance of this War Council as only showing the thinking and recommendations of those present, with no decisions taken. They often cite the passage from Admiral Mx�ller’s diary, which states: “That was the end of the conference. The result amounted to nothing.” Certainly the only decision taken was to do nothing. Historians more sympathetic to the Entente, such as British historian John Rx�hl, sometimes rather ambitiously interpret these words of Admiral Mx�ller (an advocate of launching a war soon) as saying that "nothing" was decided for 1912-13, but that war was decided on for the summer of 1914. Rx�hl is on safer ground when he argues that even if this War Council did not reach a binding decision - which it clearly did not - it did nonetheless offer a clear view of their intentions, or at least their thoughts, which were that if there was going to be a war, the German Army wanted it before the new Russian armaments program began to bear fruit. Entente sympathetic historians such as Rx�hl see this conference in which "The result amounted to nothing” as setting a clear deadline when a war was to begin, namely the summer of 1914. With the November 1912 announcement of the Russian Great Military Programme, the leadership of the German Army began clamoring even more strongly for a “preventive war” against Russia. Moltke declared that Germany could not win the arms race with France, Britain and Russia, which she herself had begun in 1911, because the financial structure of the German state, which gave the Reich government little power to tax, meant Germany would bankrupt herself in an arms race. As such, Moltke from late 1912 onwards was the leading advocate for a general war, and the sooner the better. The new French President Raymond Poincar�, who took office in 1913, was favourable to improving relations with Germany. In January 1914 Poincar� became the first French President to dine at the German Embassy in Paris. Poincar� was more interested in the idea of French expansion in the Middle East than a war of revenge to regain Alsace-Lorraine. Had the Reich been interested in improved relations with France before August 1914, the opportunity was available, but the leadership of the Reich lacked such interests, and preferred a policy of war to destroy France. Because of France’s smaller economy and population, by 1913 French leaders had largely accepted that France by itself could never defeat Germany. In May 1914, Serbian politics were polarized between two factions, one headed by the Prime Minister Nikola Pa�ić, and the other by the radical nationalist chief of Military Intelligence, Colonel Dragutin Dimitrijević, known by his codename Apis. In that month, due to Colonel Dimitrigjevic’s intrigues, King Peter dismissed Pa�ić’s government. The Russian Minister in Belgrade intervened to have Pa�ić’s government restored. Pa�ić, though he often talked tough in public, knew that Serbia was near-bankrupt and, having suffered heavy casualties in the Balkan Wars and in the suppression of a December 1913 Albanian revolt in Kosovo, needed peace. Since Russia also favoured peace in the Balkans, from the Russian viewpoint it was desirable to keep Pa�ić in power. It was in the midst of this political crisis that politically powerful members of the Serbian military armed and trained three Bosnian students as assassins and sent them into Austria-Hungary. Although the chain of events unleashed by the assassination triggered the war, the war's origins go deeper, involving national politics, cultures, economics, and a complex web of alliances and counterbalances that had developed between the various European powers since 1870. 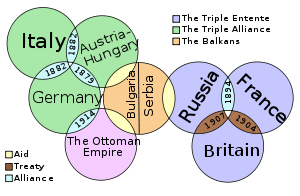 The various categories of explanation for World War I correspond to different historians' overall methods. Most historians and popular commentators include causes from more than one category of explanation to provide a rounded account of the causes of the war. The deepest distinction among these accounts is that between stories which find it to have been the inevitable and predictable outcome of certain factors, and those which describe it as an arbitrary and unfortunate mistake. In attributing causes for the war, historians and academics had to deal with an unprecedented flood of memoirs and official documents, released as each country involved tried to avoid blame for starting the war. Early releases of information by governments, particularly those released for use by the "Commission on the Responsibility of the Authors of the War" were shown to be incomplete and biased. In addition some documents, especially diplomatic cables between Russia and France, were found to have been doctored. 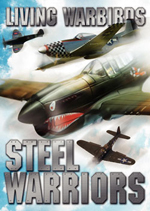 Even in later decades however, when much more information had been released, historians from the same culture have been shown to come to differing conclusions on the causes of the war. Left wing parties, especially the Social Democratic Party of Germany (SPD) made large gains in the 1912 German election. German government at the time was still dominated by the Prussian Junkers who feared the rise of these left wing parties. Fritz Fischer famously argued that they delibrately sought an external war to distract the population and whip up patriotic support for the government. Russia was in the midst of a large scale military build-up and reform which was to be completed in 1916-17. Other authors argue that German conservatives were ambivalent about a war, worrying that losing a war would have disastrous consequences, and even a successful war might alienate the population if it were lengthy or difficult. The situation in France was quite different from that in Germany but yielded the same results. More than a century after the French Revolution, there was still a fierce struggle between the left-wing French government and its right-wing opponents, including monarchists and "Bonapartists." A "good old war" was seen by both sides (with the exception of Jean Jaurx�s) as a way to solve this crisis thanks to a nationalistic reflex. For example, on July 29, after he had returned from the summit in St. Petersburg, President Poincar� was asked if war could be avoided. 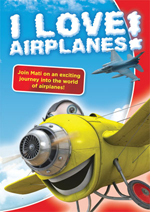 He is reported to have replied: "It would be a great pity. We should never again find conditions better." The left-wing government thought it would be an opportunity to implement social reforms (income tax was implemented in July 1914) and the right-wing politicians hoped that their connections with the army's leaders could give them the opportunity to regain power. Russian bribery under Poincar�'s careful direction of the French press from July 1912 to 1914 played a role in creating the proper French political environment for the war. Prime Minister and then President Poincar� was a strong hawk. In 1913 Poincar� predicted war for 1914. In 1920 at the University of Paris, thinking back to his own student days, Poincar� remarked "I have not been able to see any reason for my generation living, except the hope of recovering our lost provinces (Alsace-Lorraine; Poincar� was born in Lorraine)." In 1867, the Austrian Empire fundamentally changed its governmental structure, becoming the Dual Monarchy of Austria-Hungary. For hundreds of years, the empire had been run in an essentially feudal manner with a German-speaking aristocracy at its head. However, with the threat represented by an emergence of nationalism within the empire's many component ethnicities, some elements, including Emperor Franz Joseph, decided that a compromise would have to be made in order to preserve the power of the German aristocracy. In 1867, the Ausgleich was agreed upon which made the Magyar elite in Hungary almost equal partners in the government of Austria-Hungary. This arrangement fostered a tremendous degree of dissatisfaction amongst many in the traditional German ruling classes. Some of them considered the Ausgleich to have been a calamity because it often frustrated their intentions in the governance of Austria-Hungary. For example, it was extremely difficult for Austria-Hungary to form a coherent foreign policy that suited the interests of both the German and Magyar elite. Throughout the fifty years from 1867 to 1914, it proved difficult to reach adequate compromises in the governance of Austria-Hungary, leading many to search for non-diplomatic solutions. At the same time a form of social Darwinism became popular amongst many in the Austrian half of the government which emphasised the primacy of armed struggle between nations, and the need for nations to arm themselves for an ultimate struggle for survival. As a result, at least two distinct strains of thought advocated war with Serbia, often unified in the same people. 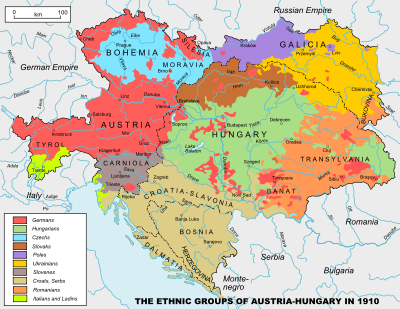 In order to deal with political deadlock, some reasoned that more Slavs needed to be brought into Austria-Hungary in order to dilute the power of the Magyar elite. With more Slavs, the South Slavs of Austria-Hungary could force a new political compromise in which the Germans would be able to play the Magyars against the South Slavs. Other variations on this theme existed, but the essential idea was to cure internal stagnation through external conquest. Another fear was that the South Slavs, primarily under the leadership of Serbia, were organizing for a war against Austria-Hungary, and even all of Germanic civilization. Some leaders, such as Conrad von Hx�tzendorf, argued that Serbia must be dealt with before it became too powerful to defeat militarily. A powerful contingent within the Austro-Hungarian government was motivated by these thoughts and advocated war with Serbia long before the war began. Prominent members of this group included Leopold von Berchtold, Alexander von Hoyos, and Johann von Forgx�ch. Although many other members of the government, notably Franz Ferdinand, Franz Joseph, and many Hungarian politicians did not believe that a violent struggle with Serbia would necessarily solve any of Austria-Hungary's problems, the hawkish elements did exert a strong influence on government policy, holding key positions. Samuel R. Williamson has emphasized the role of Austria-Hungary in starting the war. Convinced Serbian nationalism and Russian Balkan ambitions were disintegrating the Empire, Austria-Hungary hoped for a limited war against Serbia and that strong German support would force Russia to keep out of the war and weaken its Balkan prestige. Picture - Map of the world with the participants in World War I prior to the Treaty of Brest-Litovsk. The Allies are depicted in green, the Central Powers in orange and neutral countries in grey. Some scholars have attributed the start of the war to imperialism. Countries such as the United Kingdom and France accumulated great wealth in the late 19th century through their control of trade in foreign resources, markets, territories, and people. Other empires, Germany, Austria-Hungary, Italy, and Russia all hoped to do so as well in economic advantage. Their frustrated ambitions, and British policies of strategic exclusion created tensions. In addition, the limits of natural resources in many European nations began to slowly alter trade balance, and make national industries seek new territories rich in natural resources. Commercial interests contributed substantially to Anglo-German rivalry during the scramble for tropical Africa. This was the scene of sharpest conflict between certain German and British commercial interests. There have been two partitions of Africa. One involved the actual imposition of political boundaries across the continent during the last quarter of the nineteenth century; the other, which actually commenced in the mid-nineteenth century, consisted of the so-called 'business' partition. In southern Africa the latter partition followed rapidly upon the discoveries of diamonds and gold in 1867 and 1886 respectively. An integral part of this second partition was the expansion in the interior of British capital interests, primarily the British South Africa Company and mining companies such as De Beers. After 1886 the Witwatersrand goldfields prompted feverish activity among European as well as British capitalists. It was soon felt in Whitehall that German commercial penetration in particular constituted a direct threat to Britain's continued economic and political hegemony south of the Limpopo. Amid the expanding web of German business on the Rand, the most contentious operations were those of the German-financed N.Z.A.S.M. or Netherlands South African Railway Company, which possessed a railway monopoly in the Transvaal. Rivalries for not just colonies, but colonial trade and trade routes developed between the emerging economic powers and the incumbent great powers. Although still argued differently according to historical perspectives on the path to war, this rivalry was illustrated in the Berlin-Baghdad Railway, which would have given German industry access to Iraqi oil, and German trade a southern port in the Persian Gulf. A history of this railroad in the context of World War I has arrived to describe the German interests in countering the British Empire at a global level, and Turkey's interest in countering their Russian rivals at a regional level. As stated by a contemporary 'man on the ground' at the time, Jastrow wrote "It was felt in England that if, as Napoleon is said to have remarked, Antwerp in the hands of a great continental power was a pistol leveled at the English coast, Bagdad and the Persian Gulf in the hands of Germany (or any other strong power) would be a 42-centimetre gun pointed at India." On other side, "...public opinion in Germany was feasting on visions of Cairo, Baghdad, and Tehran, and the possibility of evading the British blockade through outlets to the Indian Ocean." Britain's initial strategic exclusion of others from northern access to a Persian Gulf port in the creation of Kuwait by treaty as a protected, subsidized client state showed political recognition of the importance of the issue. If outcome is revealing, by the close of the war this political recognition was re-emphasized in the military effort to capture the railway itself, recounted with perspective in a contemporary history: "On the 26th Aleppo fell, and on the 28th we reached Muslimieh, that junction on the Baghdad railway on which longing eyes had been cast as the nodal point in the conflict of German and other ambitions in the East." The Treaty of Versailles explicitly removed all German ownership thereafter, which without Ottoman rule left access to Mesopotamian and Persian oil, and northern access to a southern port in British hands alone. Rivalries among the great powers were exacerbated starting in the 1880s by the scramble for colonies which brought much of Africa and Asia under European rule in the following quarter-century, it also created great Anglo-French and Anglo-Russian tensions and crises that prevented a British alliance with either until the early twentieth century. Otto von Bismarck disliked the idea of an overseas empire, but pursued a colonial policy to court domestic political support. This started Anglo-German tensions since German acquisitions in Africa and the Pacific threatened to impinge upon British strategic and commercial interests. Bismarck supported French colonization in Africa because it diverted government attention and resources away from continental Europe and revanchism. In spite of all of Bismarck's deft diplomatic maneuvering, in 1890 he was forced to resign by the new Kaiser (Wilhelm II). His successor, Leo von Caprivi, was the last German Chancellor who was successful in calming Anglo-German tensions. After his loss of office in 1894, German policy led to greater conflicts with the other colonial powers. The status of Morocco had been guaranteed by international agreement, and when France attempted to greatly expand its influence there without the assent of all the other signatories Germany opposed it prompting the Moroccan Crises, the Tangier Crisis of 1905 and the Agadir Crisis of 1911. The intent of German policy was to drive a wedge between the British and French, but in both cases produced the opposite effect and Germany was isolated diplomatically, most notably lacking the support of Italy despite Italian membership in the Triple Alliance. The French protectorate over Morocco was established officially in 1912. In 1914, there were no outstanding colonial conflicts, Africa essentially having been claimed fully, apart from Ethiopia, for several years. However, the competitive mentality, as well as a fear of "being left behind" in the competition for the world's resources may have played a role in the decisions to begin the conflict. Picture - European military alliances shortly after outbreak of war. June 28, 1914: Serbian irredentists assassinate Archduke Franz Ferdinand of Austria. July 23: Austria-Hungary, following their own secret enquiry, sends an ultimatum to Serbia, containing several very severe demands. In particular, they gave only forty-eight hours within which to comply. Whilst both Great Britain and Russia sympathised with many of the demands, both agreed the timescale was far too short. Both nevertheless advised Serbia to comply. July 24: Germany officially declares support for Austria's position. July 24: Sir Edward Grey, speaking for the British government, asks that Germany, France, Italy and Great Britain, "who had no direct interests in Serbia, should act together for the sake of peace simultaneously." July 25: The Serbian government replies to Austria, and agrees to most of the demands. However, certain demands brought into question her survival as an independent nation. On these points they asked that the Hague Tribunal arbitrate. July 25: Russia enters a period preparatory to war and mobilization begins on all frontiers. Government decides on a partial mobilization in principle to begin on July 29. July 25: Serbia mobilizes its army; responds to Austro-Hungarian demarch� with less than full acceptance; Austria-Hungary breaks diplomatic relations with Serbia. July 26: Serbia reservists accidentally violate Austro-Hungarian border at Temes-Kubin. July 26: Russia having agreed to stand aside whilst others conferred, a meeting is organised to take place between ambassadors from Great Britain, Germany, Italy and France to discuss the crisis. Germany declines the invitation. July 27: Sir Edward Grey meets the German ambassador independently. A telegram to Berlin after the meeting states "Other issues might be raised that would supersede the dispute between Austria and Serbia…as long as Germany would work to keep peace I would keep closely in touch." July 28: Austria-Hungary, having failed to accept Serbia's response of the 25th, declares war on Serbia. Mobilisation against Serbia begins. July 29: Russian general mobilization is ordered, and then changed to partial mobilization. July 29: Sir Edward Grey appeals to Germany to intervene to maintain peace. July 29: The British Ambassador in Berlin, Sir Edward Goschen, is informed by the German Chancellor that Germany is contemplating war with France, and furthermore, wishes to send its army through Belgium. He tries to secure Britain's neutrality in such an action. July 30: Russian general mobilization is reordered at 5:00 P.M.
July 31: Austrian general mobilization is ordered. July 31: Germany enters a period preparatory to war. July 31: Germany sends an ultimatum to Russia, demanding that they halt military preparations within twelve hours. July 31: Both France and Germany are asked by Britain to declare their support for the ongoing neutrality of Belgium. France agrees to this. Germany does not respond. August 1 (3 A.M.): The King of Great Britain personally telegraphs the Tsar of Russia. August 1: French general mobilization is ordered. August 1: German general mobilization is ordered. August 1: Germany declares war against Russia. August 1: The Tsar responds to the king's telegram, stating "I would gladly have accepted your proposals had not the German ambassador this afternoon presented a note to my Government declaring war." August 3: Germany, after France declines (See Note) its demand to remain neutral, declares war on France. Germany states to Belgium that she would "treat her as an enemy" if she did not allow free passage of German troops across her lands. August 3: Britain, expecting German naval attack on the northern French coast, states that Britain would give "all the protection in its powers." August 4: Germany invades Belgium according to the modified Schlieffen Plan. August 4 (midnight): Having failed to receive notice from Germany assuring the neutrality of Belgium, Britain declares war on Germany. August 6: Austria-Hungary declares war on Russia. August 23: Japan, honouring the Anglo-Japanese Alliance, declares war on Germany. Note: French Prime Minister Rene Viviani merely replied to the German ultimatum that "France will act in accordance with her interests." Had the French agreed to remain neutral, the German Ambassador was authorized to ask the French to temporarily surrender the Fortresses of Toul and Verdun as a guarantee of neutrality. As David Stevenson has put it, "A self-reinforcing cycle of heightened military preparedness…was an essential element in the conjuncture that led to disaster…The armaments race…was a necessary precondition for the outbreak of hostilities". David Herrmann goes further, arguing that the fear that "windows of opportunity for victorious wars" were closing, "the arms race did precipitate the First World War". If Archduke Franz Ferdinand had been assassinated in 1904 or even in 1911, Herrmann speculates, there might have been no war; it was "the armaments race…and the speculation about imminent or preventive wars" which made his death in 1914 the trigger for war. Some historians see the German naval build-up as the principal cause of deteriorating Anglo-German relations. The overwhelming British response, however, proved to Germany that its efforts were unlikely to equal the Royal Navy. In 1900, the British had a 3.7:1 tonnage advantage over Germany; in 1910 the ratio was 2.3:1 and in 1914, 2.1:1. Ferguson argues that "so decisive was the British victory in the naval arms race that it is hard to regard it as in any meaningful sense a cause of the First World War". This ignores the fact that the Kaiserliche Marine had narrowed the gap by nearly half, and that the Royal Navy had long intended to be stronger than any two potential opponents; the United States Navy was in a period of growth, making the German gains very ominous. Technological changes, with oil- rather than coal-fuelled ships, decreasing refuelling time while increasing speed and range, and with superior armour and artillery also would favour the growing and newer German fleet. The Russian Tsar had originally proposed The Hague peace conference of 1899 and the second conference of 1907 for the purpose of disarmament, which was supported by all the signatories except for Germany. Germany also did not want to agree to binding arbitration and mediation. The Kaiser was concerned that the United States would propose disarmament measures, which he opposed. Motivated by Wilhelm II’s enthusiasm for an expanded German navy, Grand Admiral Alfred von Tirpitz championed four Fleet Acts from 1898 to 1912 and from 1903 to 1910, the Royal Navy embarked on its own massive expansion to keep ahead of the Germans. This competition came to focus on the revolutionary new ships based on the Dreadnought, which was launched in 1906. In 1913, there was intense internal debate about new ships due to the growing influence of John Fisher's ideas and increasing financial constraints. It is now generally accepted by historians that in early-mid 1914 the Germans adopted a policy of building submarines instead of new dreadnoughts and destroyers, effectively abandoning the two power standard, but kept this new policy secret so that other powers would be delayed in following suit. Although the naval race as such was abandoned by the Germans before the war broke out, it had been one of the chief factors in the United Kingdom joining the Triple Entente and therefore important in the formation of the alliance system as a whole. The belief that a war in Europe would be swift, decisive and "over by Christmas" is often considered a tragic underestimation; if it had been widely thought beforehand that the war would open such an abyss under European civilization, it would not likely have been prosecuted. This account is less plausible on a review of the available military theory at the time, especially the work of Ivan Bloch, an early candidate for the Nobel Peace Prize. Bloch's predictions of industrial warfare leading to bloody stalemate, attrition, and even revolution, were widely known in both military and pacifist circles. Some authors such as Niall Ferguson argue that the belief in a swift war has been greatly exaggerated since the war. He argues that the military planners, especially in Germany, were aware of the potential for a long war, as shown by the famous Willy-Nicky telegraphic correspondence between the emperors of Russia and Germany. He also argues that most informed people considered a swift war unlikely. However, it was in the belligerent governments' interests to convince their populaces that the war would be brief through skillful use of propaganda, since such a message encouraged men to join the offensive, made the war seem less serious and promoted general high spirits. Military theorists of the time generally held that seizing the offensive was extremely important. This theory encouraged all belligerents to strike first in order to gain the advantage. The window for diplomacy was shortened by this attitude. Most planners wanted to begin mobilization as quickly as possible to avoid being caught on the defensive. Some historians assert that mobilization schedules were so rigid that once it was begun, they could not be cancelled without massive disruption of the country and military disorganization and so diplomatic overtures conducted after the mobilizations had begun were ignored. However in practice these timetables were not always decisive. The Tsar ordered general mobilization canceled on July 29 despite his chief of staff's objections that this was impossible. A similar cancellation was made in Germany by the Kaiser on August 1 over the same objections, although in theory Germany should have been the country most firmly bound by its mobilization schedule. Barbara Tuchman offers another explanation in the Guns of August-that the nations involved were concerned about falling behind their adversaries in mobilization. 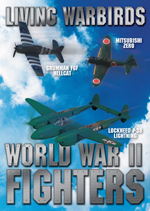 According to Tuchman,war pressed against every frontier. Suddenly dismayed, governments struggled and twisted to fend it off. It was no use. Agents at frontiers were reporting every cavalry patrol as a deployment to beat the mobilization gun. General staffs, goaded by their relentless timetables, were pounding the table for the signal to move lest their opponents gain an hour's head start. Appalled upon the brink, the chiefs of state who would be ultimately responsible for their country's fate attempted to back away but the pull of military schedules dragged them forward. Germany's strategic vulnerability, sandwiched between its allied rivals, led to the development of the audacious (and incredibly expensive) Schlieffen Plan. Its aim was to knock France instantly out of contention, before Russia had time to mobilize its gigantic human reserves. 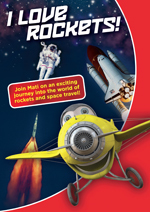 It aimed to accomplish this task within 6 weeks. Germany could then turn her full resources to meeting the Russian threat. Although Count Alfred von Schlieffen initially conceived the plan before his retirement in 1906, Japan's defeat of Russia in the Russo-Japanese War of 1904 exposed Russia's organizational weakness and added greatly to the plan's credibility. The plan called for a rapid German mobilization, sweeping through the Netherlands, Luxembourg, and Belgium, into France. Schlieffen called for overwhelming numbers on the far right flank, the northernmost spearhead of the force with only minimum troops making up the arm and axis of the formation as well as a minimum force stationed on the Russian eastern front. Schlieffen was replaced by Helmuth von Moltke, and in 1907-08 Moltke adjusted the plan, reducing the proportional distribution of the forces, lessening the crucial right wing in favor of a slightly more defensive strategy. Also, judging Holland unlikely to grant permission to cross its borders, the plan was revised to make a direct move through Belgium and an artillery assault on the Belgian city of Lix�ge. With the rail lines and the unprecedented firepower the German army brought, Moltke did not expect any significant defense of the fortress. The significance of the Schlieffen Plan is that it forced German military planners to prepare for a pre-emptive strike when war was deemed unavoidable; otherwise Russia would have time to mobilize, and Germany would be crushed by Russia's massive army. On August 1, Kaiser Wilhelm II briefly became convinced that it might be possible to ensure French and British neutrality and cancelled the plan despite the objections of the Chief of Staff that this could not be done and resuming it only when the offer of a neutral France and Britain was withdrawn. It appears that no war planners in any country had prepared effectively for the Schlieffen Plan. 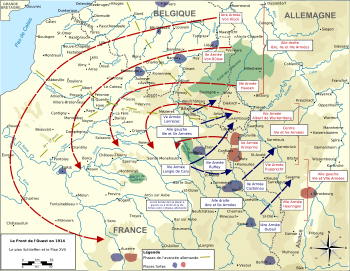 The French were not concerned about such a move because they were confident that their offensive, Plan XVII, would break the German center and cut off the German right wing moving through Belgium and because German forces were expected to be tied down by an early Russian offensive in East Prussia. In explaining why neutral Britain went to war with Germany, Kennedy (1980) recognized it was critical for war that Germany become economically more powerful than Britain, but he downplays the disputes over economic trade imperialism, the Baghdad Railway, confrontations in Eastern Europe, high-charged political rhetoric and domestic pressure-groups. Germany's reliance time and again on sheer power, while Britain increasingly appealed to moral sensibilities, played a role, especially in seeing the invasion of Belgium as a necessary military tactic or a profound moral crime. The German invasion of Belgium was not important because the British decision had already been made and the British were more concerned with the fate of France(pp 457-62). Kennedy argues that by far the main reason was London's fear that a repeat of 1870-when Prussia and the German states smashed France-would mean Germany, with a powerful army and navy, would control the English Channel, and northwest France. British policy makers insisted that would be a catastrophe for British security. Picture - Napoleon III and Bismarck after the 1870 Battle of Sedan, of the Franco-Prussian War. Many of the direct origins of World War I can be seen in the results and consequences of the Franco-Prussian War. 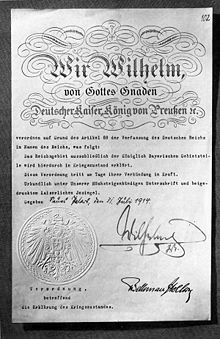 This conflict brought the establishment of a powerful and dynamic Germany, causing what was seen as a displacement or unbalancing of power: this new and prosperous nation had the industrial and military potential to threaten Europe, and particularly the already established European powers. Germany’s nationalism, its natural resources, its economic strengths and its ambitions sparked colonial and military rivalries with other nations, particularly the Anglo-German naval arms race. A legacy of animosity grew between France and Germany following the German annexation of parts of the formerly French territory of Alsace-Lorraine. The annexation caused widespread resentment in France, giving rise to the desire for revenge, known as revanchism. French sentiments wanted to avenge military and territorial losses, and the displacement of France as the pre-eminent continental military power. French defeat in the war had sparked political instability, culminating in a revolution and the formation of the French Third Republic. Bismarck was wary of this during his later years and tried to placate the French by encouraging their overseas expansion. However, anti-German sentiment remained. A Franco-German colonial entente that was made in 1884 in protest of an Anglo-Portuguese agreement in West Africa proved short-lived after a pro-imperialist government under Jules Ferry in France fell in 1885. France quickly recovered from its defeat in the Franco-Prussian war. France paid its war remunerations and began to build its military strength again. Bismarck allowed the idea that Germany was planning a preventative war against France to be leaked through a German newspaper so that this recovery could not be realized. However, the Dreikaiserbund sided with France rather than with Germany, forcing Bismarck to back down. On night between June 10/11 1903, a group of Serbian officers assassinated unpopular King Alexander I of Serbia. The Serbian parliament elected Peter Karađorđević as the new king of Serbia. Dynastic change for consequence had rallying Serbian on Russia and France rather than on Austria-Hungary as it was case during rule of Obrenović dynasty. Serbian desire to relieve itself of Austrian influence provoked the Pig War, an economic conflict, from which Serbia eventually came out as the victor. Austria-Hungary, desirous of solidifying its position in Bosnia-Herzegovina, annexed the provinces on October 6, 1908. The annexation set off a wave of protests and diplomatic maneuvers that became known as the Bosnian crisis, or annexation crisis. The crisis continued until April 1909, when the annexation received grudging international approval through amendment of the Treaty of Berlin. During the crisis, relations between Austria-Hungary, on the one hand, and Russia and Serbia, on the other, were permanently damaged. After an exchange of letters outlining a possible deal, Russian Foreign Minister Alexander Izvolsky and Austro-Hungarian Foreign Minister Alois Aehrenthal met privately at Buchlau Castle in Moravia on September 16, 1908. At Buchlau the two agreed that Austria-Hungary could annex the Ottoman provinces of Bosnia and Herzegovina, which Austria-Hungary occupied and administered since 1878 under a mandate from the Treaty of Berlin. In return, Austria-Hungary would withdraw its troops from the Ottoman Sanjak of Novibazar and support Russia in its efforts to amend the Treaty of Berlin to allow Russian war ships to navigate the Straits of Constantinople during times of war. The two jointly agreed not to oppose Bulgarian independence. While Izvolsky moved slowly from capital to capital vacationing and seeking international support for opening the Straits, Bulgaria and Austria-Hungary moved swiftly. On October 5, Bulgaria declared its independence from the Ottoman Empire. The next day, Austria-Hungary annexed Bosnia-Herzegovina. On October 7, Austria-Hungary announced its withdrawal from the Sanjak of Novi Pazar. Russia, unable to obtain Britain's assent to Russia's Straits proposal, joined Serbia in assuming an attitude of protest. Britain lodged a milder protest, taking the position that annexation was a matter concerning Europe, not a bilateral issue, and so a conference should be held. France fell in line behind Britain. Italy proposed that the conference be held in Italy. German opposition to the conference and complex diplomatic maneuvering scuttled the conference. On February 20, 1909, the Ottoman Empire, acquiesced to the annexation and received ₤2.2 million from Austria-Hungary. Austria-Hungary began releasing secret documents in which Russia, since 1878, had repeatedly stated that Austria-Hungary had a free hand in Bosnia-Herzegovina and the Sanjak of Novibazar. At the same time, Germany stated it would only continue its active involvement in negotiations if Russia accepted the annexation. Under these pressures, Russia agreed to the annexation, and persuaded Serbia to do the same. The Treaty of Berlin then was amended by correspondence between capitals from April 7 to April 19, 1909, to reflect the annexation. The Balkan Wars in 1912-1913 led to increased international tension between Russia and Austria as well as a strengthening of Serbia and a weakening of Turkey and Bulgaria which might otherwise have kept Serbia in check thus disrupting the balance of power in Europe in favor of Russia. Russia initially agreed to avoid territorial changes, but later in 1912 supported Serbia's demand for an Albanian port. An international conference was held in London in 1912-1913 where it was agreed to create an independent Albania, however both Serbia and Montenegro refused to comply. After an Austrian, and then an international naval demonstration in early 1912 and Russia's withdrawal of support Serbia backed down. Montenegro was not as compliant and on May 2, the Austrian council of ministers met and decided to give Montenegro a last chance to comply and if it would not then to resort to military action, however seeing the Austrian military preparations the Montenegrins requested the ultimatum be delayed and complied. The Serbian government having failed to get Albania now demanded that the other spoils of the First Balkan War be reapportioned, and Russia failed to pressure it to back down. Serbia and Greece allied against Bulgaria, which responded with a preemptive strike against their forces beginning the Second Balkan War. The Bulgarian army however crumbled quickly when Turkey and Romania joined the war. The Balkan Wars strained the German/Austro-Hungarian alliance. The attitude of the German government to Austrian requests of support against Serbia was initially both divided and inconsistent. However, after the German Imperial War Council of 8 December 1912, it was clear that Germany was not ready to support Austria-Hungary in a war against Serbia and her likely allies. In addition, German diplomacy before, during, and after the Second Balkan War was pro-Greek and pro-Romanian and in opposition with Austria-Hungary's increasingly pro-Bulgarian views. The result was tremendous damage to Austro-German relations. Austrian foreign minister Leopold von Berchtold remarked to German ambassador Heinrich von Tschirschky in July 1913 that "Austria-Hungary might as well belong ‘to the other grouping’ for all the good Berlin had been". In September 1913, it was learned that Serbia was moving into Albania and Russia was doing nothing to restrain it while the Serbian government would not guarantee to respect Albania's territorial integrity and suggested there would be some frontier modifications. In October 1913, it was decided by the council of ministers that Serbia be sent a warning followed by an ultimatum, that Germany and Italy be notified that there would be some action and asked for support, and that spies be sent to ascertain if there was an actual withdrawal. Serbia responded to the warning with defiance and the Ultimatum was dispatched on October 17 and received the following day demanding that Serbia evacuate Albanian territory within eight days. Serbia complied, and the Kaiser made a congratulatory visit to Vienna to try to fix some of the damage done earlier in the year. The conflicts demonstrated that a localized war in the Balkans could alter the balance of power without provoking general war and reinforced the attitude in the Austrian government. That had been developing since the Bosnian annexation crisis that ultimatums were the only effective means of influencing Serbia and that Russia would not back its refusal with force. They also dealt catastrophic damage to the Habsburg economy. 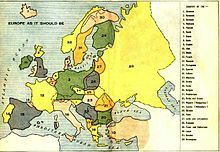 Picture - Louis P. B�n�zet's map of "Europe As It Should Be" (1918), depicting imagined nations based on ethnic and linguistic criteria. B�n�zet's book The World War and What was Behind It (1918) blamed on German aggression combined with perceived threats to the traditional social order from radicals and ethnic nationalists. During the period immediately following the end of hostilities, Anglo-American historians argued that Germany was solely responsible for the start of the war. However, academic work in the English-speaking world in the later 1920s and 1930s blamed participants more equally. Since 1960, the tendency has been to reassert the guilt of Germany, i.e., “The Berlin War Party,” although some historians have argued for shared guilt or pointed to the Entente. Fay, Sidney The Origins Of The World War, New York: Macmillan, 1929, 1928 OCLC 47080822. Kennedy, Paul The Rise of the Anglo-German Antagonism, 1860-1914, Allen & Unwin, 1980 ISBN 0-04-940060-6. Leslie, John (1993). “The Antecedents of Austria-Hungary’s War Aims,” Wiener Beitrx�ge zur Geschichte der Neuzeit Elisabeth Springer and Leopold Kammerhofer (Eds. ), 20: 307-394. Ponting, Clive (2002). Thirteen Days. Chatto & Windus. Tuchman, Barbara. The Guns of August, New York. The Macmillan Company, 1962. Describes the opening diplomatic and military manoeuvres.